Our #1 Selling Paver Sealer Product! SuperSeal Brick Paver Sealer is a clear non-yellowing solvent based acrylic sealer that will protect your Brick Pavers and Decorative Concrete surfaces from the sun's U.V. damaging rays, heavy traffic, oil, and other foreign objects. SuperSeal will enhance the natural appearance of your Brick Pavers and Cement with a "wet" look but will not make the Brick Pavers slippery. SuperSeal Brick Paver Sealer can be used for Stamped Concrete, Stamped Cement, Decorative Cement, Concrete Brick Pavers, Acid Stained Cement, Concrete Stains, and Exposed Aggregate. 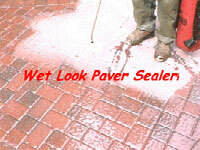 SuperSeal Brick Paver Sealer is a much higher solid content (25%) than similar water based (7-10%) products. 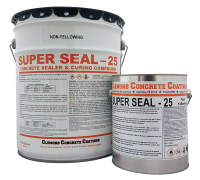 SuperSeal Brick Paver Sealer can be sprayed on with the Chapin 1949 Concrete Sprayer or applied with a 1/2" roller cover. It is to thick for a plastic "inexpensive" sprayer. SuperSeal Brick Paver Sealer will help solidify sand in between the pavers and reduce the amount of weeds. One coat is recommended. Coverage is about 100 feet per gallon or 500 feet per five gallon. One coat will result in a satin/semi-gloss sheen depending on porosity of brick. Extra coats will result in a higher gloss. Click here for a VOC Compliant Product.